Mid-Market revival continues at "The Hall"
On September 30, San Francisco Mayor Ed Lee joined a festive crowd in announcing the opening of the Hall, a destination food emporium at 1028 Market Street. Formerly occupied by the long closed Hollywood Billiards, the Hall’s revival from its rundown state is a fit parallel to Mid-Market’s renaissance after decades of decline. 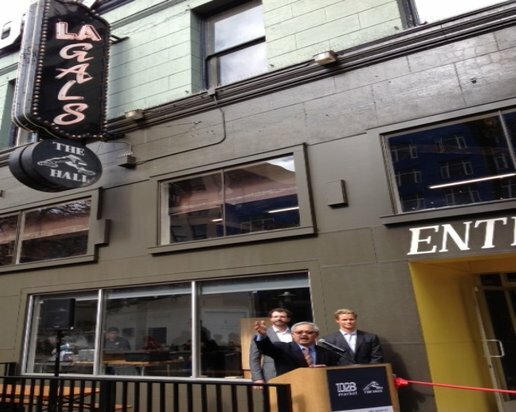 In fact, Mid-Market has come a great distance even from the day in August 2012 when I attended the mayor’s opening event for Machine Coffee at nearby 1024 Market. Lee made it a point when looking down the street to highlight the nearby Hollywood Billiards blight. The Mayor said then that he hoped someone would purchase the property and transform it; two years later he has gotten his wish. The Hall features a distinctive architectural design that builds on the site’s history. That is critical for an historic street far too long plagued by newly created bad architecture and design. The recently completed renovations of the Eastern Outfitter’s Building and the Wilson Building show off the brilliance of historic Market Street architecture. The new pop up restaurants at the Hall are setting a positive model for new additions to the area. The site will ultimately include 186 rental units and nearly 10,000 square feet of retail. It will also have 131 bike parking spaces, a plan consistent with hopes to transform Market Street into a bicycle thoroughfare. The Hall is now open seven days a week from8:00 am until 8:00pm. I sampled the cuisine of Raj+Singh at the event and found it first-rate.